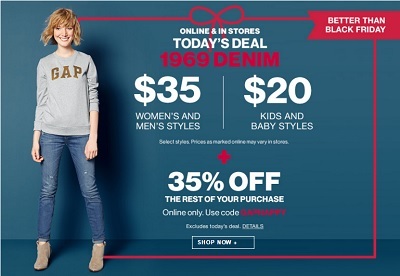 Today Gap Canada is offering a nearly better offer than Black Friday Deals. Men's and women's styles are now available for $35 and kids and babies styles are now available only for $20. This offer is valid today only (11/23/2015), on selected styles. Plus, take 35% off the rest of your purchase. This part of the offer is valid online only with promo code GAPHAPPY (enter at checkout), expires 11/25/2015. Official source of the information is Gap Canada. More details about the promotion available at Canadian stores.